The video clip below shows how local body politicians can be fooled by people misrepresenting the science. The culprit (unsurprisingly for the fluoride issue) is Paul Connett, Executive Director of the anti-fluoride propagandist group Fluoride Action Network (FAN). He relies on his PhD to provide authority – and the fact that few people in his audiences have the time or background to check out his claims. At the moment, Connett is putting a lot of effort into promoting the myth that fluoridation causes a decrease in IQ. In this very short video clip (just over 1 minute) of a recent presentation to the Denver Water Board Connett massages data reported by Xiang et al., (2003a) to pull the wool of the Board’s eyes.. The innocent victims in his audience, including the Denver Water Board members, were no doubt impressed by this graph Connet used. It looks pretty convincing, doesn’t it? There appears to be a statistically very significant decrease in IQ with an increase in drinking water fluoride above about 1 ppm F? (Community water fluoridation [CWF] usually uses a concentration of about 0.7 ppm). All the data points are lined up in a row. That is until you look at the original data. This figure is from Xiang et al., (2003a). Not so convincing, eh? Clearly, with such a wide scatter of the data, fluoride is only part of the story – if it has any effect at all. But this is the sort of graph one needs to consider when looking at correlations. Connett obtained his figure by breaking the data up into ranges. It looks prettier – but is misleading. 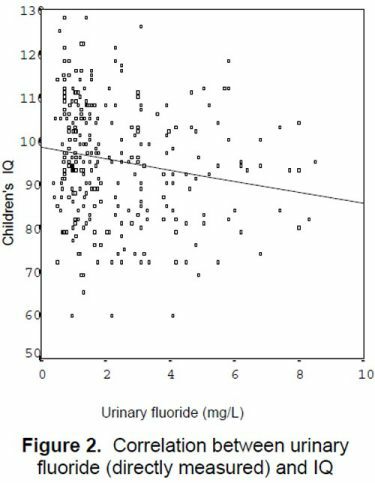 Although the correlation is statistically significant, urinary fluoride explains only 3% of the variance in IQ! This tells us that fluoride has very little effect on IQ and it is very likely that it would have no explanatory role at all once other factors were considered in the statistical analysis! I think it is inhumane to make the claims Connett does on such a flimsy correlation. His biased advocacy is, in effect, denying any efforts to find the real causes of the IQ variation. Connett’s claim that data was “controlled for” confounding factors is just not true. Xiang did not include any of these other factors in the statistical analysis of the data in Figure 2. He only compared average values of these factors for the two villages in the study. There were no proper correlations across all the data. Xiang reported no differences between villages for urinary iodine, family income, and parent’s education level. However, there was an average age difference between the villages and he reported that IQ was influenced by age. The drinking water arsenic concentrations were higher in the low fluoride village than the high fluoride village (Xiang et al., 2013). Incidentally, in a later paper (Xiang et al., 2003b) presents data for blood lead. This time he did check for a correlation across all samples and found there was no statistically significant correlation with IQ. But this was separate and not incorporated into a statistical analysis together with fluoride concentrations. There was no real checking for the effect of confounding factors on the correlation of IQ with fluoride. This question is disingenuous as science can never prove something can never happen – it can only consider the evidence for it happening. Evidence of the sort presented by Xiang et al. (2003a). Scientific reviews look at the evidence, consider its reliability, compare it with evidence from other studies and draw conclusions. Connett is disparaging about scientific reviews of the fluoride literature because he does not understand that such literature requires critical and intelligent analysis. Things like the high concentrations and doses used in animals studies he refers to. And looking below surface claims to see what the data really says – as I have done here. This is what reviewers of the scientific literature do all the time. All Connett has relied on here is his own confirmation bias – and his emotions. Policy makers should beware of such advocacy. *Note: Observant readers might note the second figure compares IQ with urine fluoride concentration. Unfortunately, he did not give a similar figure for fluoride concentration in drinking water. However, this is well correlated with urine fluoride. 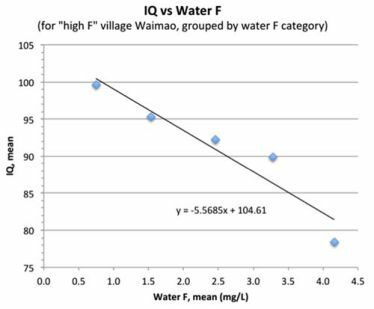 And, as urine concentration is a better indicator of fluoride intake that drinking water concentration, this figure does give a useful picture of the variance in the data Xiang used. Incidentally, I have made several attempts without success, to get the original water fluoride concentrations from Xiang (who has so far not replied to several emails) and Connett (who told me that he does not want me contacting him again!). Xiang, Q; Liang, Y; Chen, L; Wang, C; Chen, B; Chen, X; Zhouc, M. (2003a). Effect of fluoride in drinking water on children’s intelligence. Fluoride, 36(2), 84–94. Xiang, Q.; Liang, Y.; Zhou, M. . and Z. H. (2003b). BLOOD LEAD OF CHILDREN IN WAMIAO–XINHUAI INTELLIGENCE STUDY. Fluoride, 36(3), 198–199. Xiang, Q., Wang, Y., Yang, M., Zhang, M., & Xu, Y. (2013). Level of fluoride and arsenic in household shallow well water in wamiao and xinhuai villages in jiangsu province, china. Fluoride 46(December), 192–197.